Dulci-Tune - Owl Mountain Music, Inc.
-DulciTuner Genius design: A Snark® tuner on a post that fits over your hammered dulcimer tuning pins! 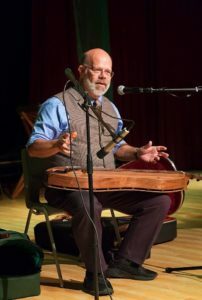 Stop wasting time gathering your tuner and your tuning wrench and your tuning clip to get your hammered dulcimer ready to play. This all-in-one Snark® tuner fits right over the tuning pin, picks up the vibrations of the instrument and quickly and accurately helps you get your instrument in tune. It can remain in place while you play in an unobstrusive way (although when people ask me what that is, I tell them it is my speedometer!) and it fits in the same pouch as my tuning wrench and hammers.